Here is a wonderfully evocative photo of Morden UndergrounD Station (near to where I grew up) with the Derby Week ‘racing fraternity’ in full flood, having arrived by Tube and queuing up for transporting to Epsom Downs/Tattenham Corner. I count about twelve of these bone-shakers. At the end of the day, the scene would be played out in reverse! Note the inspector on his boxes directing what appears to be a very smooth operation. One wonders if he was a tic-tac man in his off-duty hours! 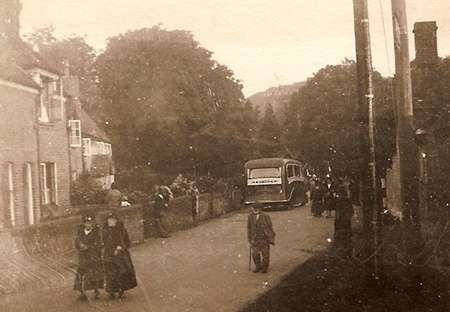 The S-Type bus was first introduced around 1920. It was larger than the similar-designed K-Type, and could carry 56 passengers as opposed to the slightly earlier and smaller K-Type’s 46, making it popular on the busier routes. They were withdrawn between about 1930 and 1932, as new and infinitely better LT and ST types came off the production lines. Since Morden Station was built in 1927, the scene can fairly accurately be dated, therefore, at between 1927 and 1932. One S-Type (S742) survives as part of the Transport of London Collection and appears at rallies from time to time. When I collected bus numbers, using my Ian Allan ABC book for reference, I would bunk off school for these few days each year. London Transport would bring in buses from every corner of its territory (and every dark corner of its garages) to support this challenging feat. In an area which usually had austerity Daimlers, pre-war RT’s and STL’s, Morden would come alive with austerity Guys and Bristols, Godstone and Watford’s green STL’s and ancient LT’s and ST’s from afar, many with chalk crosses on their wings, signifying their imminent doom, once this final task had been fulfilled! Maybe these S-types were also on the way to the bone (shakers) yard after the last horse had run and passengers deposited at Morden! When Chris Youhill posted his Daimler/Brush Hybrid HGF 948, it made me search out another such vehicle. Although LGOC’s associate, AEC, had designed the AEC Renown chassis and they had gone into service in 1929 as the LT class, LGOC decided to do its own thing and designed the experimental CC chassis (double deck) and; CB chassis (single deck). Six of each were planned for the experiment, but, of the CC chassis, only four were built. The first two had bodies like LT’s, but not quite, especially in respect of having a primitive cab totally open to the elements! The latter two had superficially standard LT bodies. Keeping well away from AEC, LGOC gave them Meadows engines, with radiators looking like stretched versions of the Leyland TD1 radiator. LT1000 went into service in 1930, was re-engined by AEC in 1933, and again in 1938, together with AEC transmission, and was finally withdrawn in May 1939, being quickly snapped up by White Heather of Southsea, who re-bodied as a coach straight away, bodybuilder unknown. The photo shows it in full splendour, parked in Francis Street, just off Vauxhall Bridge Road. Notice it sports an EIIR plaque above the windscreen centre, dating it to 1953 or a little later. Certainly, the coach was still with White Heather in September 1954. Who would turn down the chance of a mystery tour with this beauty? Of the four vehicles, amazingly, two of the others survived after being sold by London Transport, both going to Billy Smart’s Circus and lasting to 1948, one then going on to another owner before being scrapped. Knowing how notoriously conservative bus operators are, one wonders how such non-standard chassis came to be bought second-hand and how they were kept running for so long. Two of the four actually remained in service longer than their LT cousins! I can’t trace the body builder, but my thoughts are that the area above the windscreen (destination blind, WHITE HEATHER motif and vent where the EIIR plaque is placed) is quite like Duple bodies of that time. Does anyone else know? Photograph and Copy contributed by Chris Hebbron (acknowledging the website Ian’s Bus Stop for some information). The front destination indicators are Plaxton shaped, as is the rear end. (Half-cab late forties/early fifties era.) These are observations, not knowledge after the fact. I’m sure you may well be right David – the E11R emblem is mounted on what appears to be Plaxton’s standard circular air intake for full front coaches of that period. No, Chris Hebbrons Duple guess was correct. There is quite a lot of information about this body in Alan Townsin’s book "Duple – 70 years of coachbuilding". It was originally exhibited at the 1937 Commercial Motor Show atop a remarkable Tilling Stevens prototype six-wheel underfloor-engined (flat eight diesel) chassis called the Successor. Nothing more was heard of the Tilling Stevens project, but the body, after extensive modifications, was re-used by White Heather postwar. There is also a photo in the book of a Wakefields 1938 Leyland TS8 with exactly the same layout of indicator apertures and air intake vent, but this only serves to show the amazing variety of bodywork being produced by Duple at that time, as other contemporary examples had totally different layouts. 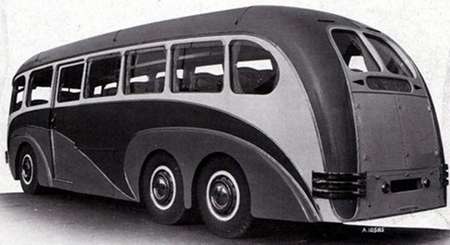 After Peter, W’s interesting posting and revelation that the body was built by Duple and was originally fitted to the Tilling-Stevens Successor, I found a photo of the original vehicle, as published on the front page of Bus & Coach magazine for December 1937 (just one month after I was born, in fact!). It is useful in showing a nearside view and the fact that, if unaltered in this respect, it had a centre-entrance door. Certainly, the body must have undergone extensive alteration, not least because the Successor had an underfloor engine, but the CC Class had a front engine. The story is far more interesting than I ever realized! And it is fascinating the way we contributors feed off each other, too. Many thanks Chris H and Peter for an authoritative answer to a tantalising question – and what another gem of a fascinating vehicle this was. As Chris H says, what an amazing parallel with Ledgards HGF 948! Yes, a fascinating parallel activity between this White Heather coach, and the Ledgard vehicle referred to on another contribution. It is perhaps even more remarkable because it might be said that Ledgards had a reputation and expertise for such a conversion, whereas White Heather seemed to be just an ordinary local coach operator in Southsea. But see below – the conversion wasn’t by them! White Heather Transport Ltd was acquired by Basil Williams of Hants and Sussex fame in 1977 (although his main operations were known as Southern Motorways by that time). The PSV Circle produced a fleet list (ref PK14, dated March 1986), which includes the vehicles of acquired and associated companies, and also those owned by acquired companies but disposed of before Basil Williams was involved. This records one Bedford OB new to White Heather in 1947, recorded with a White Heather C25F body (4, DBK 944), but this is the only one listed with such a body. A note indicates that the body framing came from a Leyland Cub (unspecified). So perhaps there was some ingenuity and workshop capacity, but it didn’t apply to the LGOC vehicle. The Bedford was sold in 1953 to a Southampton company, last licensed in 1963. On examining the PSV fleet list, the conversion of the LGOC CC vehicle was not carried out by White Heather, but by a dealer following it’s sale by London Transport, and before White Heather purchased it. Thank you, Michael, for the your research and additional information. Whatever dealer modified the body, they must have had extensive skills, for, like the Maudslay/Daimler body conversion, the Duple bodywork would have been extensively modified to cater for the engine/front axle being further forward. And, as with Ledgards HGF 948, the original vehicle looked more attractive. I didn’t know about WH being purchased by Basil Williams. The only other Southsea coach tour operator I recall was Byngs. Are they still around or what? Chris, further to the info that was included, the dealer who bought the LGOC CC in Aug 1939 was Mitchell’s of London SW12. 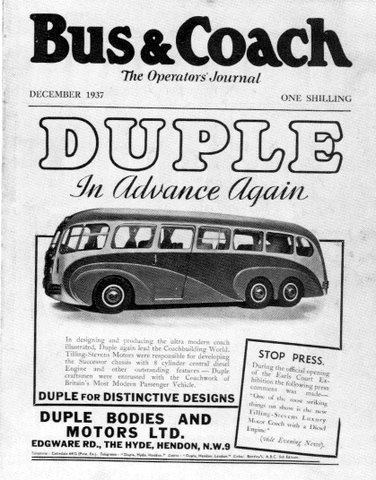 Presumably they also bought the TSM Successor/Duple coach show vehicle at a similar time, as it never entered service after being exhibited at the 1938 Motor Show. The conversion must have taken some time, or was perhaps hampered by the war years (supply or staff shortages? ), as the next operator is Fountains of Twickenham in Apr 1946. It then passed to Bluebird of Portland in June 1947, and to White Heather, Southsea in July 1949. They kept it for a creditable eight years, selling it in July 1957. It’s PSV days were over, as the PSVC record states, "unknown owner, Bosham (Sussex)" as a caravan. Finally it went for scrap to Bosham dealer Sullivan in April 1961. My own interest in buses/coaches began in the autumn of 1958, so I never knowingly saw this coach creation. White Heather had fairly standard Bedford SB / Duple coaches by this time. Chris, I can recall several local coach firms from the late 1950’s and early 1960’s, unfortunately none of these are now in existence. Byng’s was one of the major operators, with an attractive blue livery and a modern fleet. There was also Southsea Royal Blue, which carried similar (or the same?) livery by c.1962. Southsea Royal Blue was also acquired by Basil Williams’ Hants and Sussex c. 1947, but was sold on when the H&S group ran into difficulties in the mid 1950’s. Another local company was Don’s, which had a pleasant yellow livery (with brown trim? ), which I think started c. 1923. Neither Byng’s or Don’s had any connection with Basil Williams. But by c.1960 each of these three companies were owned by a Lancashire group, whose name I cannot now recall, but may have been Blackburn based. This meant that similar vehicles were operated by each company, and the style of fleet-name script was the same. As mentioned previously, White Heather was another local company, again independent until Basil Williams purchased it in 1977. This name has now disappeared from the local scene, as Hants and Sussex / Southern Motorways as a whole. There was also an associated Victoria Coaches (which I think usually only had one coach), but there was a family connection which kept this firm alive. Triumph Coaches was another company bought up by Basil Williams, again in 1947, and they specialised in Forces work. Again this was sold on in the 1950’s, and ended up as a subsidiary of Southdown for several years. As a result, the fleet I remember was always standard Southdown stock (initially Beadle-bodied Tiger Cubs) painted blue and cream instead of Southdown green, and with Southdown series fleet numbers prefixed with a "T". The later stock included 36 foot Leopards with rare Weymann Castillian bodies. Eventually, the Triumph name fell into disuse with the changing needs of the times. Other names seen locally were Hutfields of Gosport, Glider of Fareham (Glider also spent a time in Basil William’s ownership), Meatyard’s of Portchester, and Shotters of Isle of Wight. I suspect that Shotters had an outstation in Portsmouth, as some school trips I went on used a Shotters coach. All of these were around in the late 1950’s to mid/late 1960’s. I’m afraid I rather took them for granted! None of these fleetnames now appear. The main names today are Luckett’s (Fareham) and Vision Travel. They use fine modern vehicles, but are rather outside the scope of this web-site! Hope these names bring back memories for some of you. I often notice pictures of the Portsmouth coach operators as they have Oldham (BU) registrations. This was a result of being supplied through Oldham-based dealers Lancashire Motor Traders. The Blackburn connection would explain why this was so. Wow, Michael, my simple question produced such a wealth of information and memories of my time in Pompey from 1956 to 1976, although I’d holidayed there from 1950. 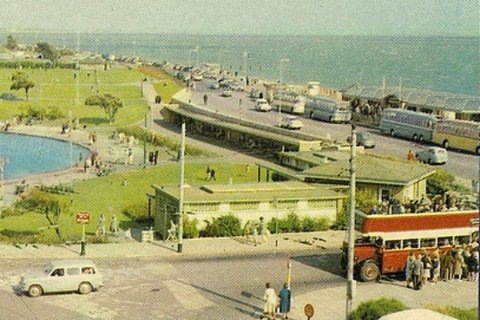 Your comments reminded me of one of several Portsmouth & Southsea postcards I possess (J Arthur Dixon – remember them! ), one of which shows the place where all the coaches parked along the seafront, by the small kiosks and associated ‘A’ boards placed to tempt holidaymakers for all sorts of day-trip destinations and, of course, mystery tours! I note the trolleybus poles are still in situ, but the wires are not, so I’d date the photo to 1964-1966. By magnifying it in Picasa, I’ve identified, from left to right, the rear coach as White Heather’s Bedford SB/Harrington, Byng’s Bedford SB/Duple, Southsea Royal Blue’s Bedford VAL14/Plaxton and the rear (I think, from your colour description) of Don’s Bedford SB/Plaxton. I think I’ve got them all right I only recalled Triumph after I’d submitted my first piece, and did recall that Southdown had bought them out, because of their obvious Southdown-style coaches, in Triumph livery, which appeared after takeover. Ironically, they are missing in the photo. In the foreground is one of the four Portsmouth Corporation 1935 Leyland TD4’s with English Electric bodies, plying its trade on the Sea Front Service between Clarence Pier and Hayling Ferry. As you say, all gone, as have all the breweries that once served Pompey, which, being a naval port, meant that there were many. Within half a mile of my house, near the Marine Barracks, I once counted some 12 or so, with half that number of breweries represented! But this is WELL outside the scope of this website!! A distant memory from 1963 when I did Isle of Wight tours for Wallace Arnold. There was on the Island a very smart coach firm by the name of Crinage’s with a delightful cream and maroon livery – they used to do the "included" island excursions for WA. Crinage’s and Fountain Coaches were the coaching arms of Southern Vectis, although they’d existed as stand-alone companies before takeover. I don’t think SV’s policy was to come to the mainland, though. That’s amazing Chris H – I never imagined that either of those two excellent Island operators would have any connection with SV – they were both splendid undertakings who kept up immaculate appearances and conveyed the passengers round that beautiful area in complete satisfaction. After I got married, in the early ’60’s, (my wife not coming from Pompey) and I, for a Grand Day Out, would get the ferry (sometimes paddle) across to the IoW, then the steam train from Ryde to Ventnor. On one occasion, we got the now preserved 1939 Southern Vectis Bristol K5G/ECW. We had to sit in the front nearside seat for the journey. OMG, the noise and vibration! Never having really penetrated Bristol-land, and having experienced London’s pre-war RT’s and others of even earlier vintage which were far quieter and near vibration-free, the ride put me off Bristols for years! I warmed to them later. It was good to see the J. Arthur Dixon postcard – yes Southsea as it ought to be remembered! I certainly agree the front coach party in the picture is one of Don’s coaches. I had quite forgotten that some of Byngs and Southsea Royal Blue’s coaches were registered in Oldham in that period. This prompted a hazy memory that two were CBU 704C / CBU 705C. But this could be a false memory, and I have no idea of chassis/body make. I do remember White Heather’s OBK 242, a Bedford SB/Duple with the butterfly wing grille. This is confirmed by the Hants and Sussex fleet book I referred to earlier. I also remember that Don had 50 ABK. I think this was also a Bedford SB, but not sure about the body make. This is likely to have been the first PSV with a reversed Portsmouth registration, and would have been arrived late 1962 / early 1963. I didn’t often visit the Isle of Wight in the sixties, so my memories are of standard lowbridge K-types and Lodekkas. But there was Seaview Motor Services with their two Leyland PD2s in the outstanding red/green livery, one of which was replaced by a Bedford VAL. One of my first colour photos was of this VAL, but the Brownie box or the film used didn’t reproduce the colours very accurately! That’s better – (certainly better than my box brownie shot). As you say, shown in all it’s glory. With it’s "B"-reg (1964) and 1979 dated photo, it’s very smart as a 14 year old. Seaview MS must have taken great care of it. I have always read or heard the body described as Willowbrook. (I think Duple (Midland) was originally Nudd Bros and Lockyer which Duple took over, then re-named). Lovely picture of a fine vehicle and, as a bonus, a sample of the legendary Southern Vectis – one can almost sniff the sea air from The Solent !! In my view the Bedford VAL was a magical vehicle which was a delight for the enthusiast to drive – especially the very first ones where the gearbox positions were arranged like a "solve it if you can" puzzle and the two handbrakes often caught out the uninitiated. Superb suspension, acceptable performance, and a creditable impersonation of prewar Leyland gearbox tones were extra attractions. Duple did indeed acquire Nudd Bros & Lockyer of Kegworth and rename it as "Duple Midland". A few years later (in 1958) they also acquired Willowbrook and the Duple Midland operation also moved to Loughborough. The official policy after production of the Donington body ended in late 1962 was that all double-deckers and all single-deckers on "heavyweight" chassis were badged as Willowbrook products while Bedford and Ford chassis were labelled as Duple Midland. However… there are many cases where lightweight chassis actually received Willowbrook badging. Some have suggested that these anomalies were merely errors on the production line (BET style bodies on heavyweight chassis and "001" bodies on Bedfords and Fords were assembled in the same building after 1962), but there seem to be too many "errors" for this to be true. I suspect that some customers specifically requested the Willowbrook badging, or that "Wk" badges were applied if they temporarily exhausted the supply of Duple Midland ones! Does anybody have a definitive answer on this? This question of Duple (Nudd) etc is an interesting one. Were Nudd’s bus bodybuilders, for I have never heard of a Nudd/Lockyer bus body! 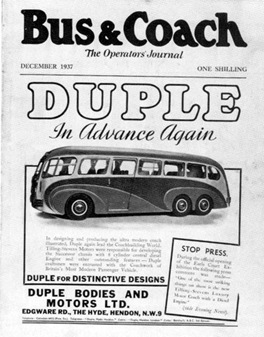 According to Alan Townsin’s Duple book, the main thrust of the Nudd/Lockyer operation immediately prior to the takeover was the rebuilding of pre-war bus bodies. This often amounted to a new body in practice, but not officially so. Midland Red was a major customer. on 24/5 Michael Hampton commented about the Byngs/Dons having BU registrations. This was because Byngd/Don/Southsea Royal Blue were OWNED by Lancashire Motor Traders from 1960/1 until the end of 1971. CBU 704/5C were not Byngs, Dons or SRB, and 50 ABK whilst it was intended for Don and registered in Portsmouth never came to Portsmouth as it was delivered instead to Bere Regis & District. LMT also owned Ivory Coaches of Tetbury which is why their coaches could be found doing Byngs excursions during the summer. Thanks to Paul Statham for your additional comments on Dons/Byngs/SRB and their ownership in the 1960’s. As I suspected my memory of those registered CBU704/705C is probably false. However I do remember quite specifically 50 ABK running locally in Don’s livery for a time when new. Was it delivered to Bere Regis in Don’s livery? Was it then loaned to Don’s to help out at a busy time? Just a further comment on Peter Williamson’s comment (30/5) on Nudd Bros & Lockyer. I agree with his statement about their work for Midland Red. I also had a feeling that a small quantity of Southdown’s Leyland Tiger Cubs were bodied by NB&L. This would be some (all?) of the 620-639 batch of 1953/54. Looking back at good old Ian Allan ABC’s, the 2nd and 4th editions of 1 – South-eastern area just state "Duple". The 5th (1963) edition states "Duple Midland" – so presumably were built at Loughborough, not Hendon. So this may be why some have attributed this work to Nudd Bros and Lockyer, although I cannot trace which fleetlist has that information. The Southdown Enthusiasts Club are publishing a series of books of complete vehicle histories. Unfortunately, the batch concerned is likely to be in the next to appear! It will be interesting to see how a modern publication describes them. Perhaps at the time those "in the know" described them as "Nudd Bros & Locker", while officially Duple wanted to highlight it’s own name as "Duple (Midland)". Further on LT 1000. The complete vehicle with original LGOC body was still extant in 1943. The late John H Price was one of the reliable bus reporters at the time who reported seeing LT 1000 owned by Pickfords (the removal people). It was based at Willow Walk (London S.E) in 1943, painted grey The roof, part of the upper deck and rear end had been removed. Thus the original chassis could not have been fitted with the coach body in the 1939. I saw the CC body without the chassis in a scrapyard in Mitcham around about 1945/6 still in the grey livery. Thx, Alan, for supplying information which fills in the wartime peregrinations of the vehicle. Incidentally, I’d like to record my enjoyment of your photos and publications over the years. You were everywhere, in all weathers, truly possessing the stamina of an ox! And how many Box Brownies did you get through?? Many thanks to Alan Cross for clarifying the war-time use of LT1000. I have checked again the text in the Hants & Sussex PSVC/OS history I drew my contribution from. This states that it went to Mitchell (dealer) London SW12, 8/39. It then lists the body transfer (undated), and the next reference is that the modified vehicle went to Fountain Coaches, Twickenham in 4/46 (then as described in my earlier contribution, going to White Heather in 7/49). The fleet history has no mention of it’s wartime activities, and I wrongly assumed (sorry!) it was out of use for the whole wartime period. Presumably Pickfords purchased or hired it from Mitchells the London dealer? It also raises the question of who carried out the body transfer and when? (But clearly after 1943, and by c.1945/46). It also raises the question as to the whereabouts of the Duple body (and the TSM Successor chassis) after 1938 until the transfer to LT1000. Did this vehicle survive complete but unused after the 1938 show until post-1943, or were body and chassis split before the conversion to LT1000? Maybe someone out there has further information on this. I’ll add my thanks to Alan Cross for his many photos seen in innumerable publications over the years, such a good contribution to our hobby. This unique vehicle is recorded for posterity on movie film. Go to 04:32mins at this link: http://www.youtube.com/ and you can see it turning slowly (complete with whine) from the seafront (where the coaches are shown on the above postcard) onto St. Helen’s Parade, Southsea. It look impeccable! I saw the White Heather coaches on my early visits to Southsea, late 1960’s and early 1970’s, but I had no idea until finding this entry that they were part of the Basil Williams empire. Hants & Sussex is mentioned in its own right, in the column on the left, and above. Is there/should there be some sort of link for cross referencing? Southampton Citybus, at or about the time First took them over, acquired Hants & Sussex. According to one of the then directors of Citybus, almost all the acquired fleet were sent straight away to the local scrapper, being replaced by the Atlantean Sprints (double deck Atlanteans given new East Lancs single deck bodies, if you didn’t know already). In the director’s words, "When you’re used to having a blind donkey with no legs, getting a blind donkey with one leg is a vast improvement." Was he being too harsh? Sorry, Paul S, my browser doesn’t want to find your website. Re: Byngs, Don, SRB, LMT et al. Like my friend Paul Statham (see above) I have studied the history of these Portsmouth coaching concerns, and tend to agree with his remarks concerning 50 ABK, which was certainly intended for the Don fleet for the 1962 season. However, as parent company LMT was a dealer, it was alleged that every coach in the fleets was for sale, and that they could disappear at any time. In the case of 50 ABK this certainly happened at the beginning of the 1962 season, and so it may have arrived in Southsea in Don livery, and it may have even run for a few days as a Don vehicle, but until now this has never been substantiated. PSV Circle records do, however, record the coach as being delivered new to Bere Regis, so the mystery remains! 1962 was the first season that Don was supplied with new coaches by LMT. The operating fleet for the previous season was seven, and with six new coaches including 50 ABK allocated for 1962, one existing coach SB3 UTP 422 was retained. With the disappearance of 50 ABK only six coaches ran in Don livery for 1962. Ironically, UTP 422 was sold to Bere Regis the following year! Fleet strength returned to seven for the 1963 season. Many thanks to both Philip and Paul for their comments on 50 ABK. Possibly I saw it on a BR&D excursion to Southsea, and drew the wrong conclusions. Wasn’t there also a Don coach registered 850 ABK? If so, that would feed into the confused memories of that era – all notes I made sadly consigned to a bin long ago! 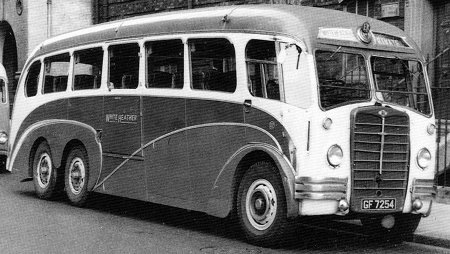 Incidentally, in a slightly earlier era, Hants and Sussex bought several Leyland PS1/1’s with Duple coach bodywork in 1947/48. About six of these, plus a Bedford OB/Duple were sold to BR&D after only a year with H&S. They lasted in Dorset until 1960/61, according to the PSVC Hants and Sussex list. It’s an interesting parallel in on going connections between some of these firms, even though there was no official business connection between BR&D and any of the Southsea operators covered here. Michael: 850 ABK is a Duple Britannia-bodied AEC Reliance, also a constituent of the 1962 Don allocation. This coach remained in the fleet until 1964 when it was involved in a collision with a Portsmouth PD2! It was sold as seen to Chiltern Queens, which repaired the coach and ran it in service for many, many years. It is today in preservation at the Oxford Bus Museum with John Bayliss, and is currently under restoration. I’ve been searching and have finally found this photo to post, a nearside rear view of the Tilling-Stevens Successor, before the Duple body was modified and fitted to LT1000. Michael Hampton (21/05/2011) provides a list of operators in the Portsmouth area. As a child I recollect looking through the locked doors of a garage occupying the space of not more than two houses on Copythorn Road, a residential road. In this I saw two vehicles owned by ‘Little Wonder’. I think they were a Bedford OWB with what appeared to be a typical Duple body and a half cab. Despite growing up not far away I do not recollect seeing these vehicles on the road nor that they had a ‘stand’ at the excursion area to the east of South Parade Pier. Kelly’s 1958 Street Directory shows 20 to 24 Copythorn Road as occupied by ‘Little Wonder Motor Coaches Ltd (P. W. Lambert, director)’. When checked on Google Street view the garage still existed being used by a car servicing and repair company. I believe the company was based on the Portsmouth Road in Petersfield and had at least one stage carriage route in that area. Does anyone know anything about this company? The small coach garage in Copythorn Road was indeed occupied during the period in question by Little Wonder of Petersfield as an outstation. 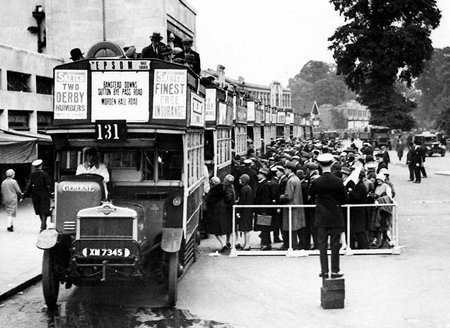 LW had no excursion licences out of Portsmouth, and so did not ply for trade on the coach stands at South Parade.. Private hire was though undertaken in Portsmouth, in addition to Forces Leave contract work. The half-cab — there is a choice from: two Fodens, a Crossley or a Leyland PS1. Two OWBs were operated, as well as a number of OBs and a WTB — any of these may have been based in Portsmouth for private hire duties at any one time. Beware the PDF cited above — it is full of errors! Little Wonder, which operated a stage carriage service out of Petersfield, sold out to Southdown on 26 October 1959. Any further accurate info welcome! Harry I have a Fleet List, more or less complete, which I can E-mail to you. Further to the above — the stage service was Petersfield-Buriton. This was the only asset acquired by Southdown. No vehicles were taken into stock — they were sold separately. The Forces Leave work would appear to have ceased. According to my notes the operator was originally I W Lambert, later incorporated as Little Wonder Coaches Ltd in November 1950, and ceased in 1959, but I’ve no idea where I got that from so I can’t vouch for it. An Omnibus Society publication dated July 1953 lists Little Wonder Coaches Ltd as having four stage services, all based on Petersfield: 301 to Alton, 302 to Froxfield, 303 to Buriton, and 304 to New Alresford. The PSVC’s Southdown fleet history lists a Petersfield – Buriton stage service being acquired from “P W Lambert (t/as Little Wonder Coaches)” on 26th October 1959. Does anybody know what the numbers in the right hand column signify? (1, 9, 41, etc.) in Chris Hebbrons list of Portsmouth coach operators. As I mentioned earlier, I suspect that the list is an index to a book and the numbers in the right-hand column refers to the pages where the coach companies get full mention. I trawled back through the URL and the book doesn’t get a mention. Many thanks to those who have provided information about Little Wonder Coaches. In the mean time a photograph has come to light in the John Boylett Memorial Collection at www.sct61.org.uk/ Little Wonder, Petersfield HOR 200, a Reading C32F bodied Commer Avenger new in February 1950, seen at Ascot. Photo taken by the late John Boylett, courtesy of John Kaye, Saturday 21 June 1958, Ascot. A Bellgraphic ticket was sold on e-bay on 16 January 2013 but the illustration does not give any information about route or fare (reference: www.ebay.com/itm/Bus-Ticket-Bellgraphic). Also an intriguing reference to a Little Wonder Coach in a participants recollections of a school trip to France in Summer 1955 when a Little Wonder Coach took the party from Portsmouth to Southampton. It appears the condition of the coach was not pristine! The reference is: www.southerngrammar.com/ then look for: Fred (Ray) Martin’s recollections of SGS and a French trip It is in the fourth paragraph down! Re Nudd, Duple, Duple (Midland), Willowbrook, my understanding is that Duple acquired Nudd Bros & Lockyer at Kegworth c4/52 then acquired an additional factory in Loughborough some time in 1955. Then, in 1956 it created Duple Motor Bodies (Midland) Ltd. for vehicles built at both sites. This happened no later than 1/6/56 but I would be interested to hear from anyone who can put a more accurate 1956 date on it (and/or the date the additional factory in Loughborough opened in 1955). The batch of Southdown Tiger Cubs MUF 620-639 were indeed built at Kegworth (in 1954) and are described in the PSV Circle’s fleet history as Duple (Nudd). Duple acquired Willowbrook in 1958 and was run separately until late in 1960 after which, in general, and as previously stated in these comments, the heavyweights were regarded as Willowbrook while the Bedfords and Fords were Duple (Midland). This continued until 1968. From 1/1/69 everything was Willowbrook. Would be interested in anyone’s comments or additional information on this brief summary. Re Percy Lambert, Little Wonder Coaches, Petersfield. Growing up in Petersfield I remember Percy and his coach company.The garage was at the junction of Borough Road and The Spain in Petersfield and could only house about two coaches with room for another outside. My only regular journey on their vehicles was on a Wednesday lunch time when I could catch the returning Froxfield coach outside of our home which would take me back to school for the afternoon. The regular driver would be Colin Harfield who was Percy`s son-in-law. My family knew other members of the family as we had links with Buriton village where I think either Percy or his wife came from I understand that Philip Lamb has a fleet list which I would appreciate a copy of if possible. I remember Bedford OB`s, the one that Colin drove I think could have had a Plaxton body. I also remember the newest coach, an early SB painted a darker green than earlier vehicles which I think went to Phil Meatyard at Portchester on closure. I was aware of a garage in Portsmouth, but had no idea of its location until reading earlier comments. The note about the Petersfield office being in Portsmouth Road I think was just the house where Percy lived. Little Wonder for Peter Hann. Yes I have a fleet list, sorry for not replying earlier, but have only today seen your request. You are correct on both your suppositions. A Plaxton-bodied OB, JX 9673, was operated, whilst SB/Duple Vega NDF 751 was sold to Meatyard in 1959, remaining there until 1963. The garage in Copythorn Road Portsmouth still exists sandwiched between terraces of houses. Today it provides a servicing facility for used car dealer Hewett on Copnor Road. By one of those uncanny co-incidences, the Hewett family ran prewar coaching company Silver King of Southsea, although the vehicles were garaged elsewhere. Get in touch with me through this site for the fleet list, which I believe to be correct — correct that is until another discovery turns up . . .
I’m Helen Lambert, Percy Lambert’s Great Grandaughter. I live in Shrewsbury where I was born and am the Grandaughter of Algy, one of Percy’s sons. Algy moved to Oswestry following his period in the Army, having met my Nan. My Dad Melvyn remembers helping out on the buses and I was wondering if you had any specific pictures of the garage, Percy and the buses. We still have a business card of Percy’s. A very belated reply to the comment above by Chris Youhill dated 22/05/11 – 11:47 about Crinages, Ventnor, Isle of Wight. Crinages were independent up until July 1967 when they sold out to Shamrock and Rambler. Fountain Coaches of Cowes were also independent but until December 1969 when they also sold out to S&R. Strangely S&R sold out/transferred their 16 Isle of Wight based coaches to Southern Vectis on 7th June 1969. These coaches were then operated basically as a separate unit by Southern Vectis in an Orange and Cream livery for several years. Many thanks Vectis 83 for that interesting chronological detail about Crinage’s. This explains why I had the strong impression in 1963 that the beautifully presented maroon and cream coaches were operated by a very proud independent concern. As old age progresses here, I can scarcely believe that I did those IOW tours more than half a century ago – a sobering thought – and my tours stayed at the superb Tenerife Hotel right at the entrance to Sandown Pier with lovely marine views and very good food indeed. The resident manager (owner possibly ?) was a Mr. Lovejoy. Its difficult now to imagine what an ordeal the journeys to and from Leeds/West Yorkshire were. There were no motorways or urban bypass roads, the speed limit for coaches was I’m sure 40 mph, and many of the inadequate meal stops were inaccessible – Winchester, for example, in a nightmare location and the last ferry to the Island from Portsmouth Hard (6.40pm if I recall) seemed like a thousand miles away !! Sad to say, Chris Y, that a quick search of Google Maps suggests that the Tenerife Hotel no longer trades under that name, although the buildings facing the pier look original. This would be my experience of life, since almost all the buildings I ever worked in have been demolished, some quite modern and short-lived! Of course, I’m crumbling a bit, too! Chris H, Many thanks for the update on the Tenerife Hotel. Luckily, I’ve just unearthed the hotel brochure which I had when I did the tours in October 1963 and you’ll be pleased to hear that the place is still in big business, but renamed the Bayshore and viewable in pictorial detail by looking up "Sandown Hotels" on the Internet. The original buildings are still to the same layout, although the frontages have been vastly altered. As you look at the picture the block on the left clinches the identification – four storeys high and the top floor obviously added on as a row of "dormers", prior to 1963 !! Brings back many happy memories for me !! Now we really are off the thread. Looked up your "Tenerife" hotel (perhaps they didn’t now want comparisons with the winter weather?!) on Trip Advisor and found it looking like so many more. However, only two "terrible" reviews and most seemed satisfied, and liked the drivers on "Alfa" holidays (hope "Romeo" wasn’t the driver) except one… "The coach driver was a danger to other drivers": never in your day Chris, even trying to access Winchester! From Google Maps, this part of Sandown still looks very ‘chipper’, I must say, unlike many seaside resorts today. As I’ve said before, in the 1960’s, my wife and I would take many summer day-trips from Southsea, where we lived, to IoW, often by paddle steamer. Sandown, Shanklin and Ventnor (by steam train) were particular favourites.